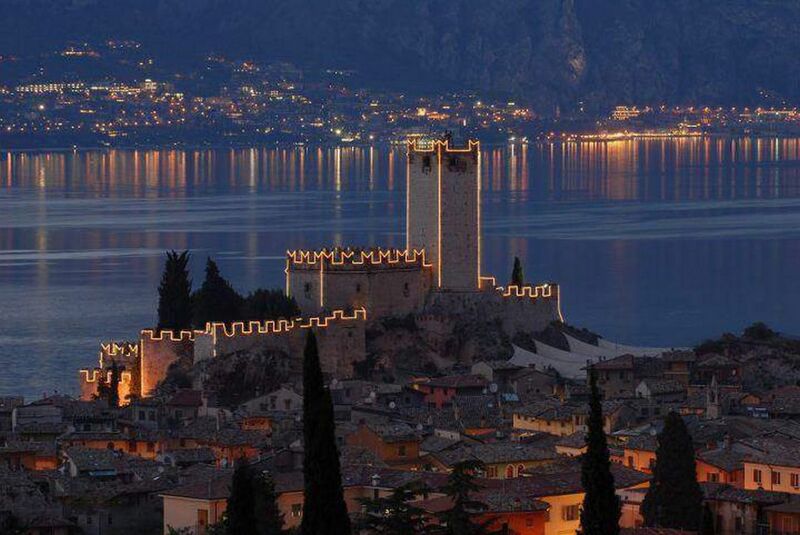 Malcesine is a lively and vibrant resort situated on the North Eastern shore of Lake Garda. Famous for it's Scaligeri Castle dating back to 568ad, and with breathtaking views of the lake below, this is without a doubt one of Lake Garda's most popular civil wedding ceremony locations.Malcesine nestles below the towering peaks of Monte Baldo and is a maze of narrow winding cobbled streets lined with shops, bars and restaurants.Focal point and centre of the resort is the colourful harbour with boats waiting to whisk you and your guests for a Champagne Cruise on the sparkling waters of the lake after your ceremony. Malcesine has a wide range of hotels and reception venues to suit all tastes and budgets. Many couples choose to have both their ceremony and reception in Malcesine with others choosing to have only their ceremony here and then travel by road or boat to another reception venue around the lake or one of our fabulous historic villas in Verona or the Valpolicella Wine Region. A great way of combining two very different settings. 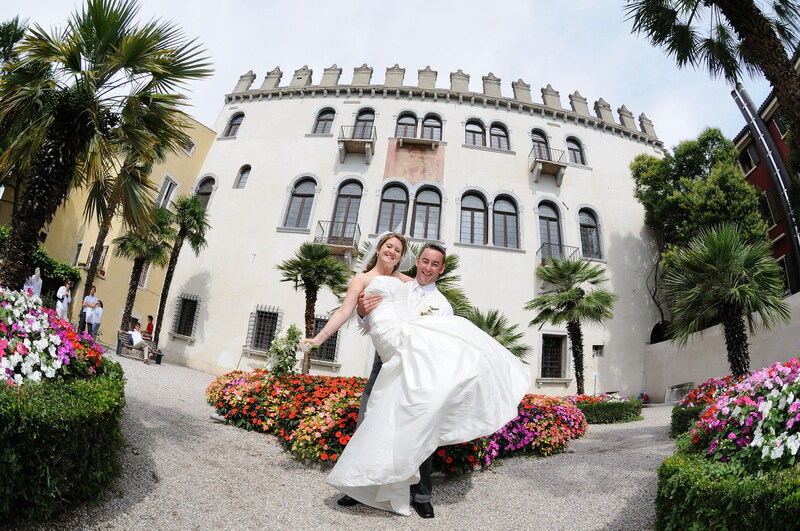 See our extensive list of Lake Garda Reception Venues for further information. 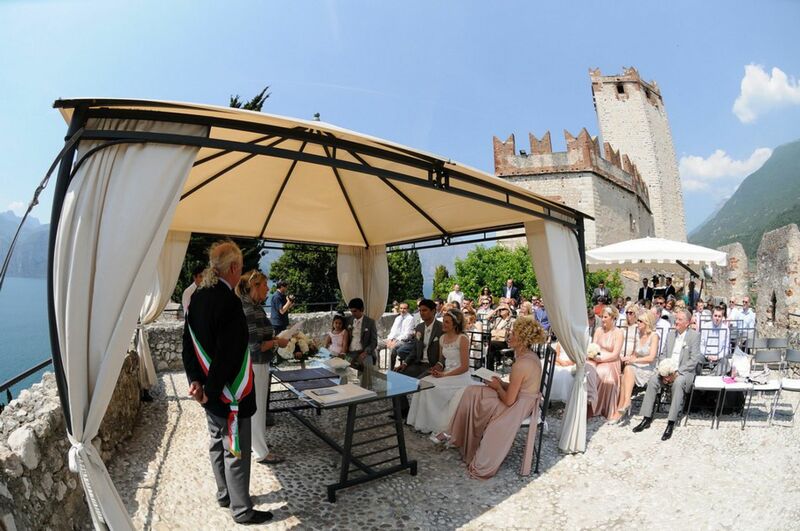 There are two amazing locations in Malcesine where a legal civil ceremony can take place. The most popular ceremony venue is the Scaligeri Castle , a Medieval fortress perched on the hill dominating the town below. Within the castle you can celebrate your ceremony on the terrace with stunning lake views. In case of inclement weather, the castle has a room overlooking the lake with a capacity for 70/80 guests( standing room for more). Please note that it is a fairly steep walk to the castle and there are stairs leading to the terrace. Guests with special needs can be tranpsorted to the part just below the final stairs leading to the terrace. 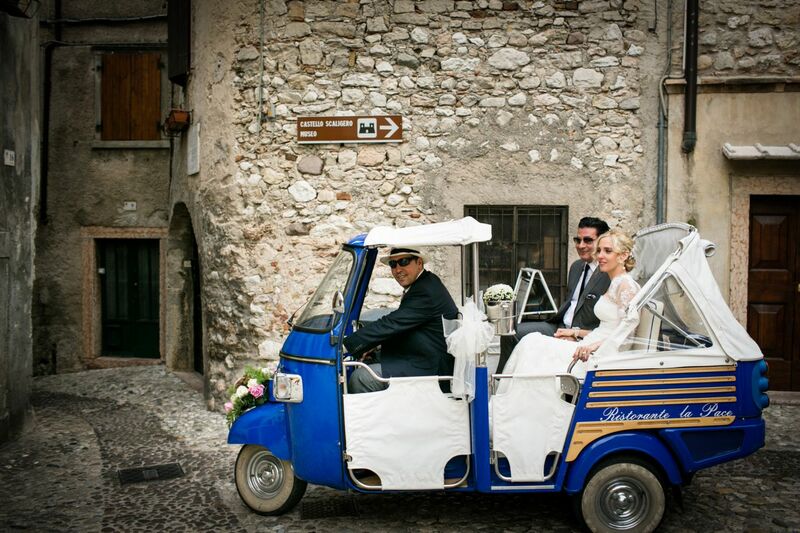 Our funky little Tuk Tuk is a great way for the Bride to arrive and for guests with extra mobility needs. Another lovely location is The Captain's Palace, located in the centre of the resort and close to the vibrant port area. The elegant charm of the Captain's Palace with it's white facade leads out to a lovely lakefront garden with amazing panoramic views. The ceremony venue is a large frescoed room with lake facing windows and seating for 80 people (additional standing room possible). There is a cute little balcony leading from the ceremony room which is great for a photo shoot. Malcesine offers some great settings to have amazing photos done with your family and friends and also great lakeside bars to have a celebratory glass of Prosecco and Nibbles after the ceremony. An amazing way to celebrate is by inviting your guests to share a fun champagne boat trip on the lake as you set sail towards the next exciting voyage in your life as Mr & Mrs.
You can then walk through the cobbled streets to your reception venue or travel to your venue by road or boat. Choosing a Wedding in Malcesine is without an amazing experience so if someone says "Marry Me in Malcesine...Give us a call ! 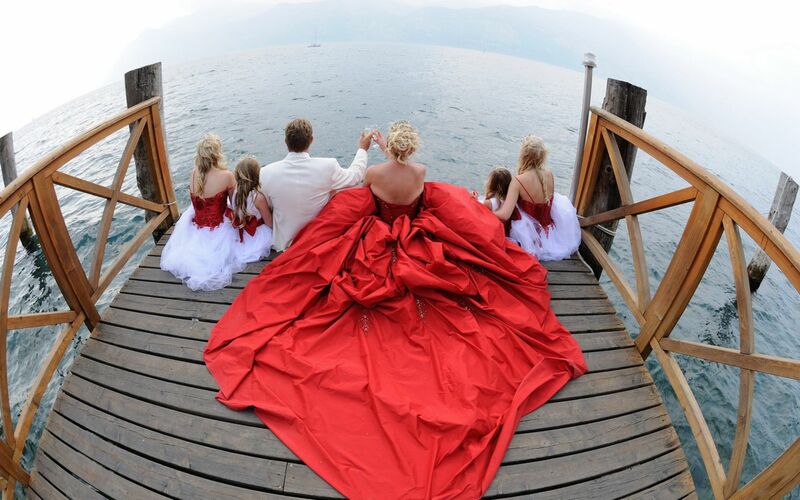 We will put our hearts and soul into helping you plan your Perfect Wedding in Malcesine. Dream Academy Wedding in Malcesine. That's Amore !